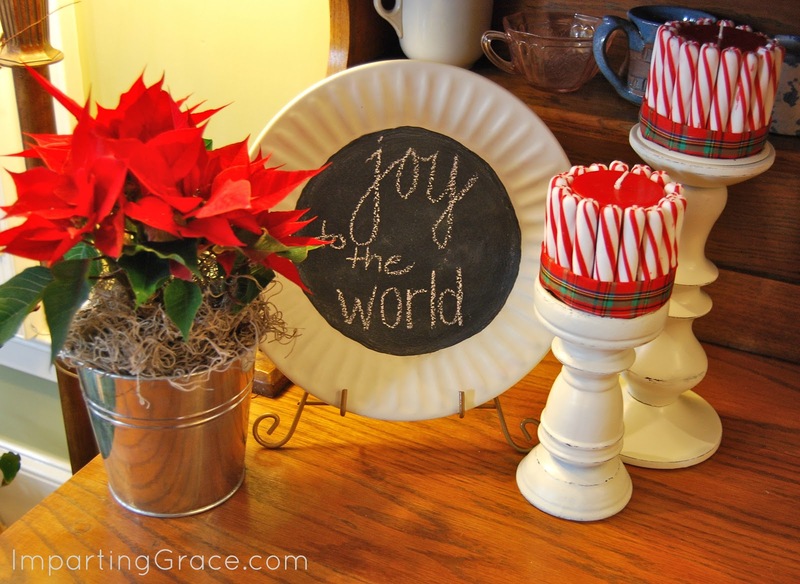 I'm excited to be participating in this week's Dollar Store Decorating series with Gina at The Shabby Creek Cottage and six other wonderful bloggers. Lindsay at Makely School for Girls is also taking part in the series today; you'll want to check out her post here! My dollar store creations are super-simple, but I'm pleased with how they turned out! While browsing the aisles of the dollar store, I was especially inspired as I looked at the display of old-fashioned candies. So I bought three bags of Bob's "Sweet Stripes" peppermint sticks, along with a couple of red pillar candles. First I used clippers to trim off the bottoms of the peppermint sticks, making them the same height as the candle. I'm tickled pink with my pretty Christmas candles! 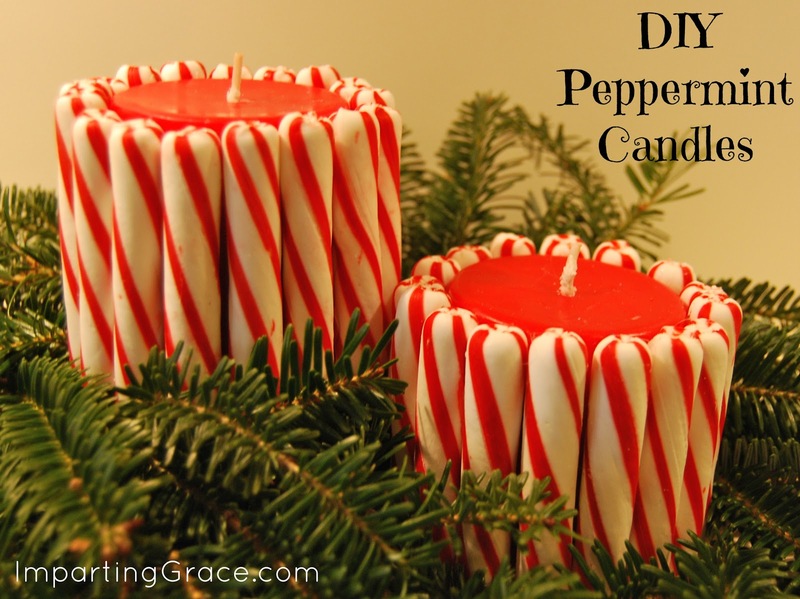 At first I was a little bummed because the pillar candles at the dollar store are smaller in diameter than they used to be, but I realized as I was gluing on my peppermint sticks that the smaller size is really better for the project. When you add the size of the candy sticks to the total diameter of the candle, it's just right for sitting atop a pillar candle holder. 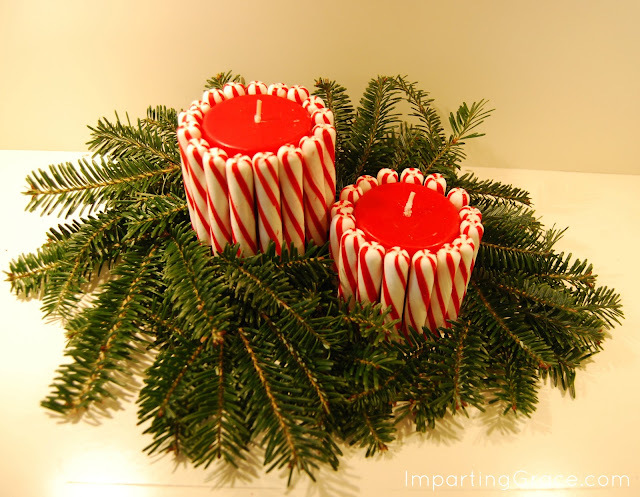 The two pillar candles cost me a total of $5.00--$1.00 for each candle plus three bags of peppermint sticks at $1.00 each. I think that's a lot of bang for the buck. That's my DIY Noël hanging in the window; click here for tutorial. I found both the scale and the gift wrap holder (complete with Christmas paper!) at an antique mall last year. I love having them displayed on the kitchen island at Christmastime. It's almost like having the counter of a general store in my kitchen! While I was at the dollar store, I found a number of items that I made into Christmas gifts. I'll share those later this week. 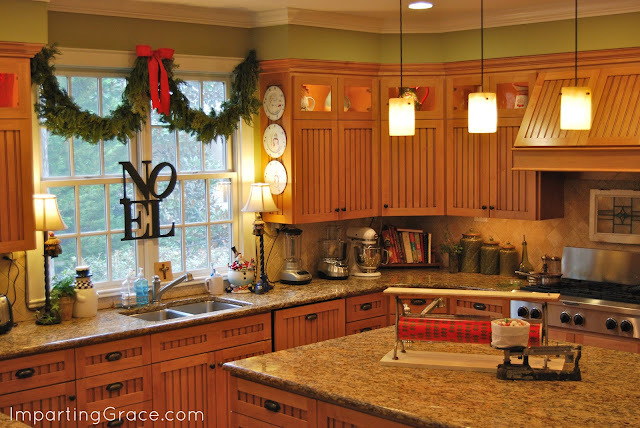 I'm so grateful to have had this chance to join the Dollar Store Decorating series! Tomorrow's posts will be contributed by Karen at The Graphics Fairy and Tonya at Love of Family and Home. You won't want to miss these. If you shop at a dollar store, you can take part in this series, too. All eight of us in this series are hosting a huge link party. Write about your dollar store decorating and join Friday's link party! So tell me--do you shop at dollar stores? Do you use dollar store purchases in your decorating? I'd love to know! 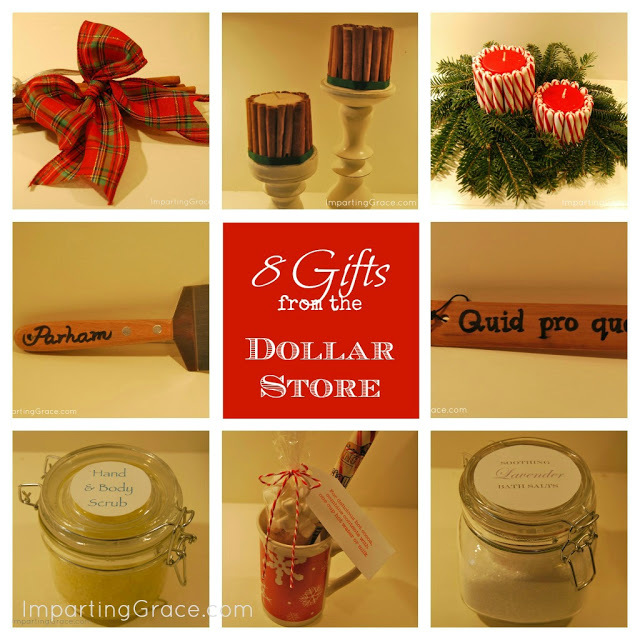 See this post for lots of gift ideas using dollar store items! Hi Richella! So nice to meet you, your craft is simply adorable and wow, what a kitchen. This was such a great project, happy we got to be introduced this way this week. 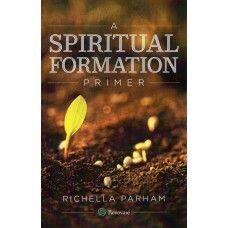 Love this idea, Richella! I will be heading to the dollar store real soon to get the supplies for this one. Also, I love the warmth of your kitchen. Your antique paper holder and scale are awesome! Do you have dollar store parties at times other than Christmas? If so, I have something I'd like to share for that. I love your site, especially the posts about faith (which we share). Thank you for all your types of inspiration!! These are so cute Richella!! Love them! They look great in your little vignette as well! Those turned out so cute Richella! I love shopping around at the dollar store! Those peppermint sticks always remind me of my grandparents:) My grandmother used to cut a hole in the top of a lemon, then stick one of the peppermint sticks in and we would use it like a straw and drink the lemon juice...kind of strange, but really fun! You are so creative! When we were growing up, my sister and I would put these peppermint sticks in oranges and drink the orange juice through them. I love how you put them around the candles - so cute! What a fun idea and so darn cute. I bought some of those striped canes at the dollar store. thanks for the inspiration. I am your newest follower. Such a pretty turnout :) And I love your kitchen!! Especially with the antique scale and wrapper. I don't shop at the dollar store very often no. Once in awhile. I love it! What an easy decoration and something even younger hands can help with! Love the candles! I love our local Dollar Tree store. It's great for greeting cards too! I love this! These are so festive and fun!! And your kitchen is gorgeous!! Those candy-wrapped pillars are just adorable, Richella! They would add such a fun look to any and all whimsical Christmas vignettes. Oh, yes, I definitely shop at the $Store, and they seem to have added a lot more things this year -- so fun! I do a lot of shopping there for stocking stuffers for the "Grands." Thanks for sharing this resourceful article. More power to you!